Did you survive Black Friday? Cyber Monday? I admit that shopping among the throngs the day after Thanksgiving held absolutely no allure for me at all. But if that was something that made you smile, then I say more power to ya. Although I found the reports of isolated violence a little distressing, didn't you? I did let my fingers do the shopping today, however. The first is a Christian Advent Calendar kit. This is a kit with everything you need to fill your own advent calendar with objects that will teach your family about the Bible. 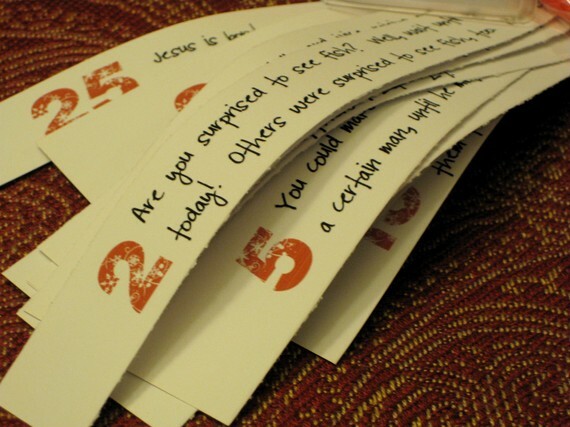 There are 25 different objects, each accompanied by a note with a corresponding Bible story. This will help you and your family focus on what Christmas is really about. These kits have been flying out of her shop--I think she only has a couple of them left. She also has created an Advent Calendar Kit PDF. This file contains the 25 scripture references and the master list of objects to put in your calendar. 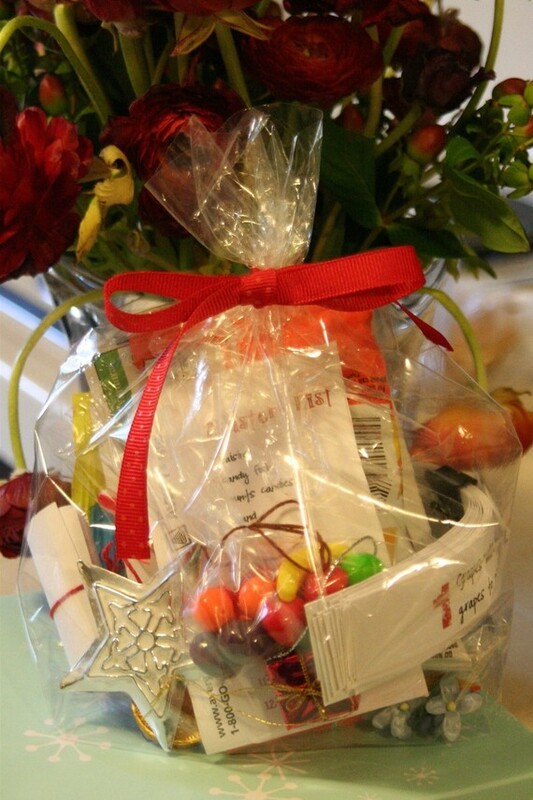 These files allow you to create your own kits for personal use or for gifts. Mark and I bought one of these kits last year, and each evening we spent a few minutes reading the Bible verse for the day and reflecting on what Christmas means to us. With all the hustle and bustle of the season, it's a nice way to spend a few minutes by the tree. i bought an advent calendar this weekend too. my first one in fact. i meant to make it, but all of a sudden it's december, and time to start. how did that happen?? I love the idea of the Advent kit and I definitely think she should take part in the name game!! I think these kits are the best! They are really about the true meaning of Advent and Christmas, where so many others I've seen lately are simply a countdown. I did happen to look in Christa's shop a few days ago and noticed they're selling like hotcakes! I think that kit is a super idea, gives everyone a little reminder when things get overwhelming and stressful. Yes, she should be part of the name game!! An Advent kit is a wonderful idea! It's no wonder they are selling fast. Going through the Advent with Chaney and Steve is one of my favorite parts of Christmas. Each year she grasps more and more and that is so fun to watch. Those are an EXCELLENT idea!! Thanks for telling us about them. I love the theme of this advent calendar and I hope she sells out quickly. Such a good idea to keep Christ in the season--something sorely lacking in the decorations, etc, all now displayed everywhere and in the magazines. Our 25 containers will be magneted to the fridge tonight! We have so much Advent to do! Our Usbourne Nativity Book, where a piece comes out every night. Christa's kit, and a new Advent book I purchased this year. It has a short devotion, a Bible verse, a fill in the blank prayer, and a simple activity for each day. We'll be busy. We also use a prayer box that was given to us from a family devotion Sunday School class. I found beads to resemble the four parts of the prayer 1. God I love you because (big read heart), 2. God I am thankful for (a yellow smiley face bead, because you are usually happy when thankful), 3. God I am sorry for (a big cross pendant because Jesus died on the cross to forgive our sins), and 4. God please help (a Bible locket pendant for baptism pictures, b/c the Bible can help guide us and others). I love Advent I think more than Christmas. L.O.V.E. A.D.V.E.N.T. So off I go, to get home and get everything done so we can head to the Road to Christmas Advent activity at church tonight! What beautiful ideas. We to easily forget what we are celebrating. Just found your blog thru another one... and JUST finished my Advent Calender (a bit late but I did it!) and was going to put Bible verses in each pocket... this kit pdf is PERFECT!